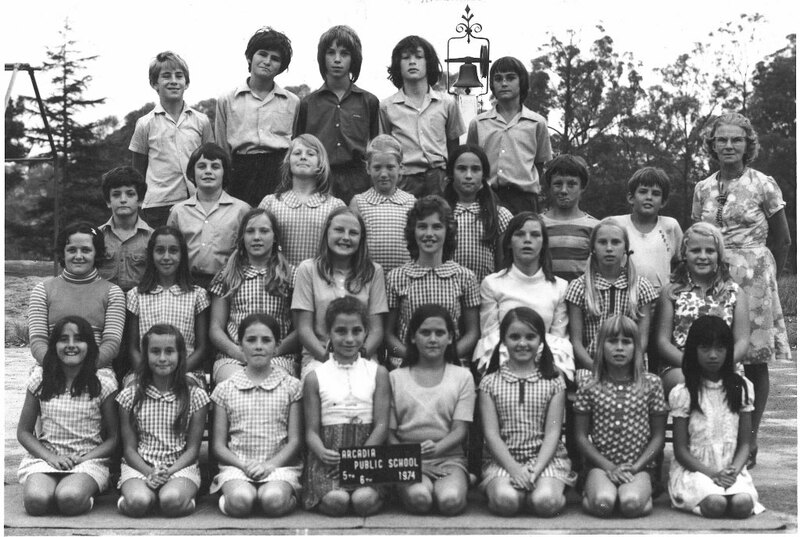 1971 – The P&C purchased the school a piano and duplicator. 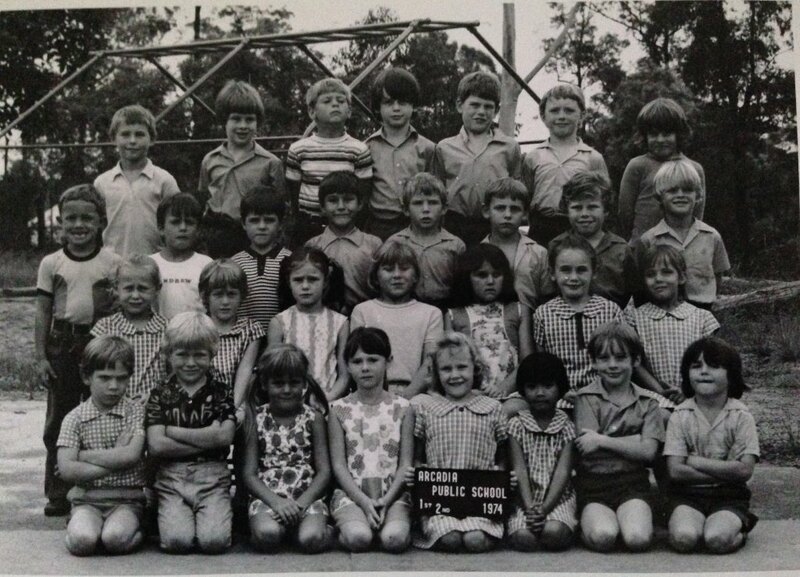 1971 – Berrilee Public School was invited to join APS for sports day. 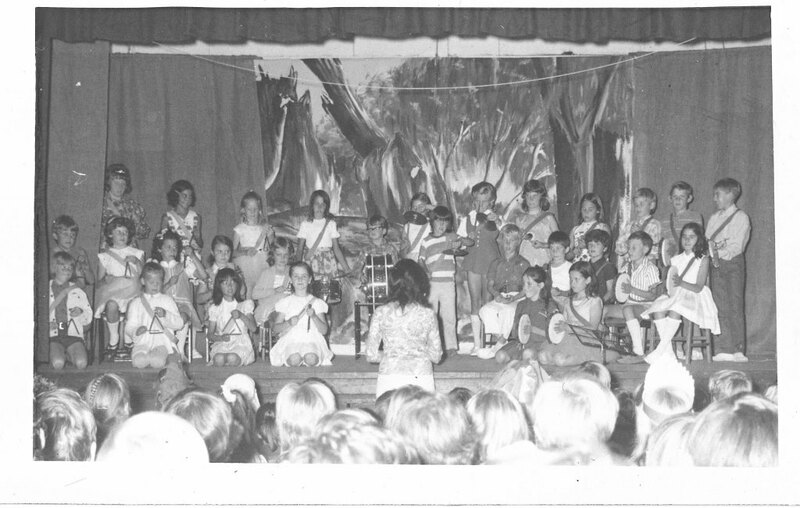 1971 – Events held at the school included luncheons, Christmas Party, jewellery demonstrations, tennis days, ‘housie’, afternoon teas and fashion parades. 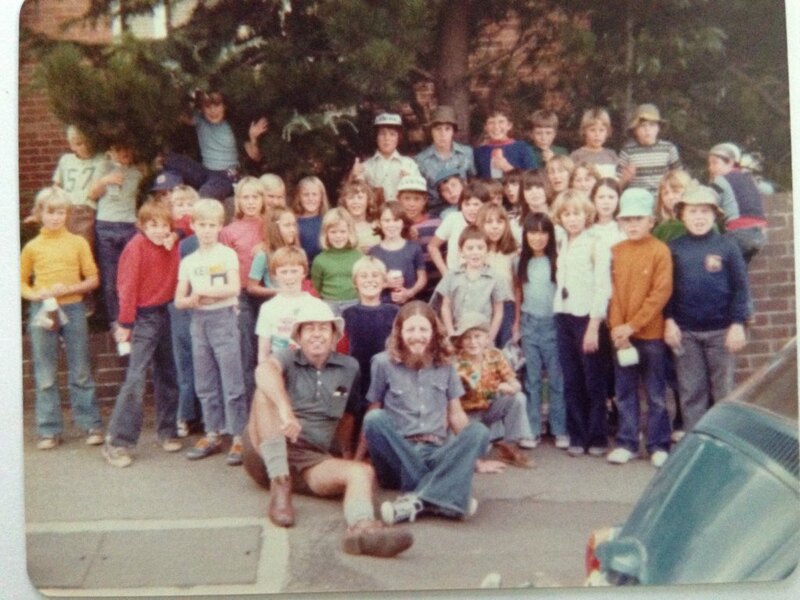 1972 – Vision Valley Arcadia Opened, operated by Wesley Mission. 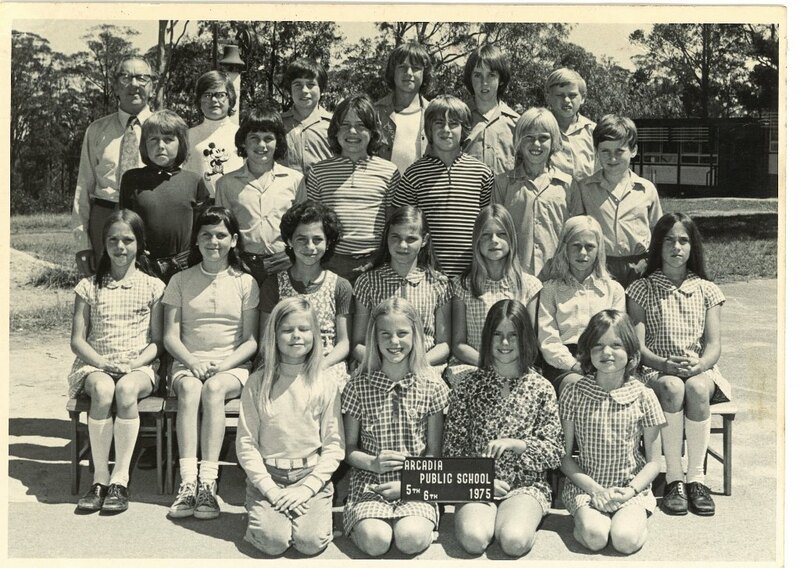 1972 – Galston High School opened. 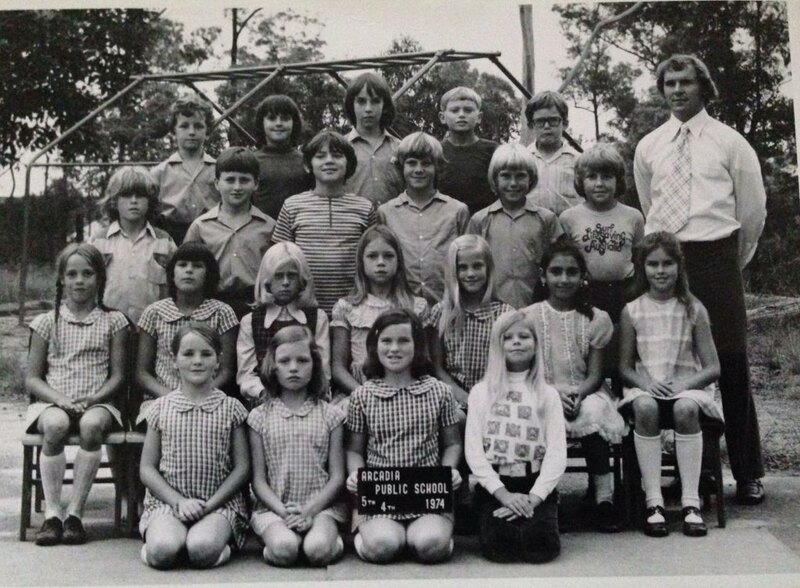 1972 – Mr John Orman was Principal from February 1972 till July 1976, 133 pupils. 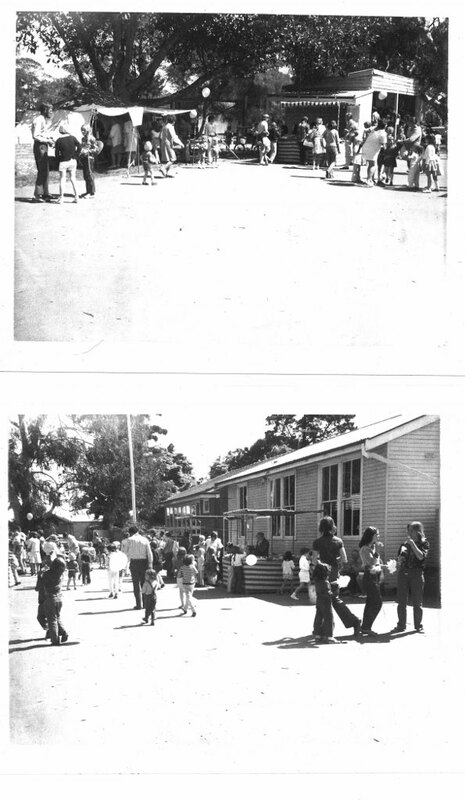 Mr Orman’s family were the last to use the school residence. 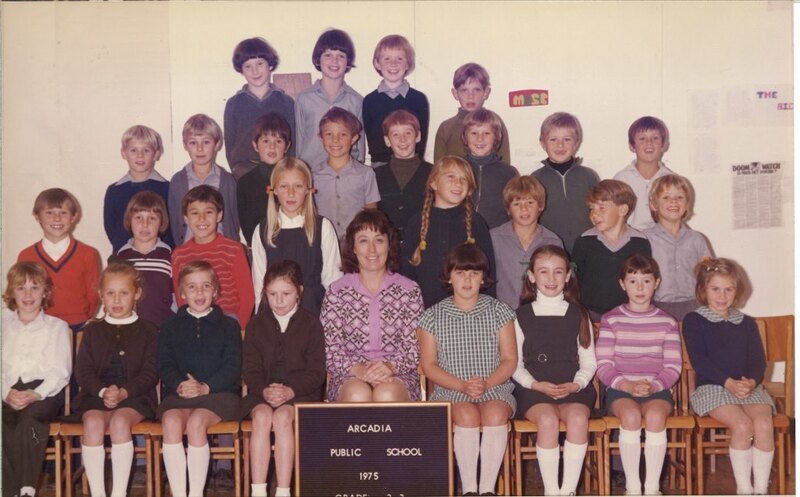 During this time while waiting for additional classrooms, the School of Arts was used for Mr Collette’s 5th class. 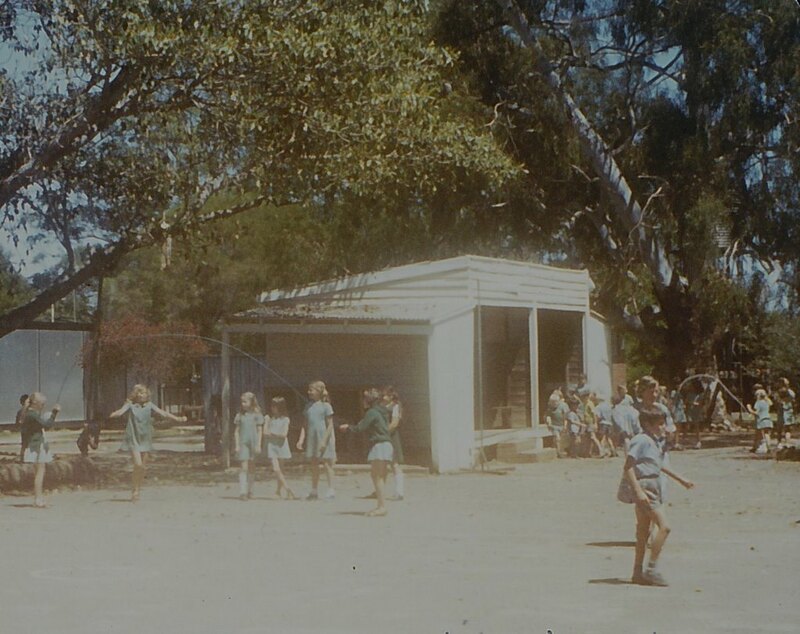 The travelling or mobile library would visit after the Galston Library was opened. 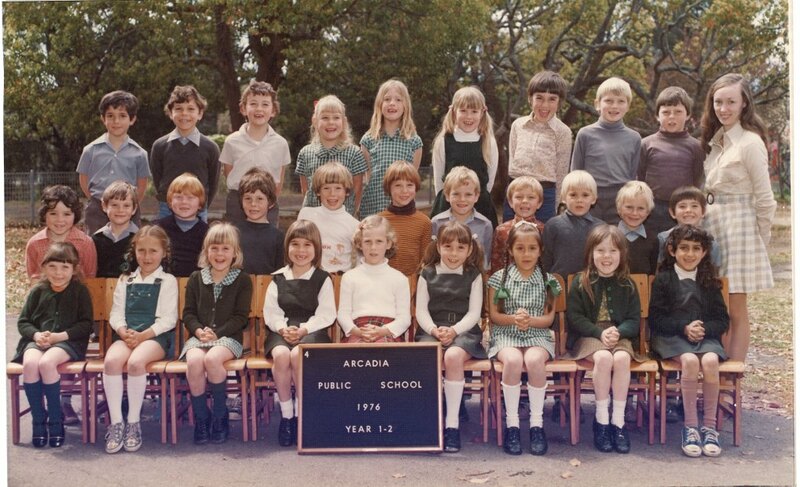 1972 – The state of the road outside the school was in poor condition so the children were walked across to the School of Arts (Now Arcadia Community Centre) for afternoon pick-ups. 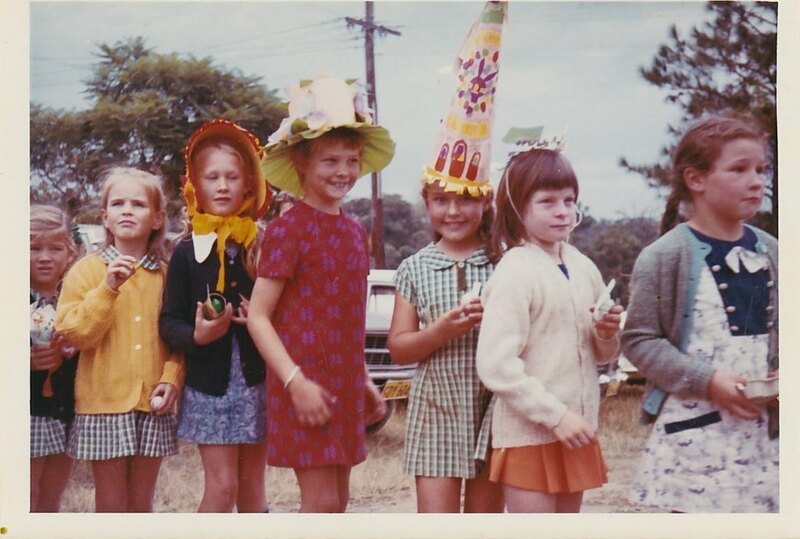 1973 – On 22nd September the P&C and Mothers Auxiliary held a Country Fair. 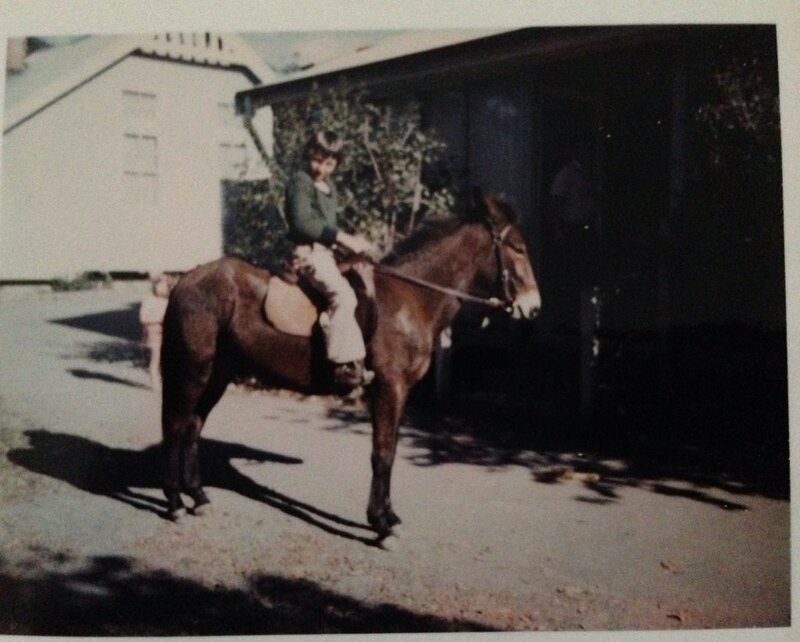 1973 – On the 28th August 1973 the Minister for Transport, The Hon. Charlie Jones, MP announces the decision to site the second Sydney airport at Galston. 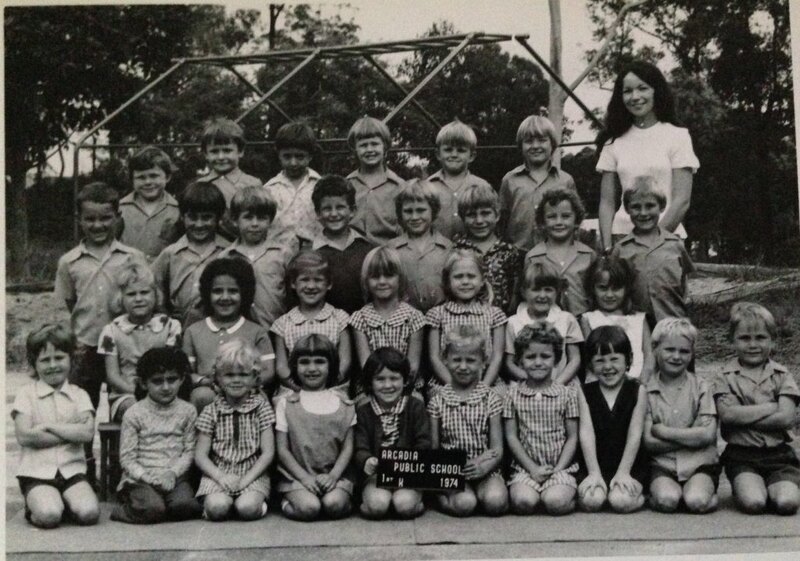 Two thousand Galston residents demonstrated outside Parliament house on 12th September 1973 of which Arcadian Mothers Auxiliary member supported this action. 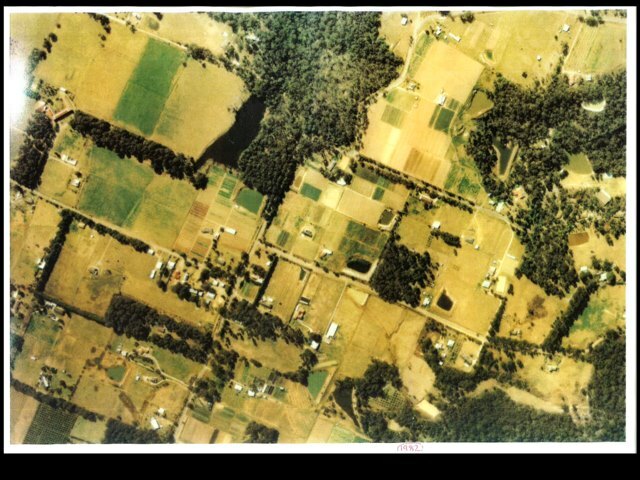 On 10th May 1974, Galston was ruled out of being the second airport. 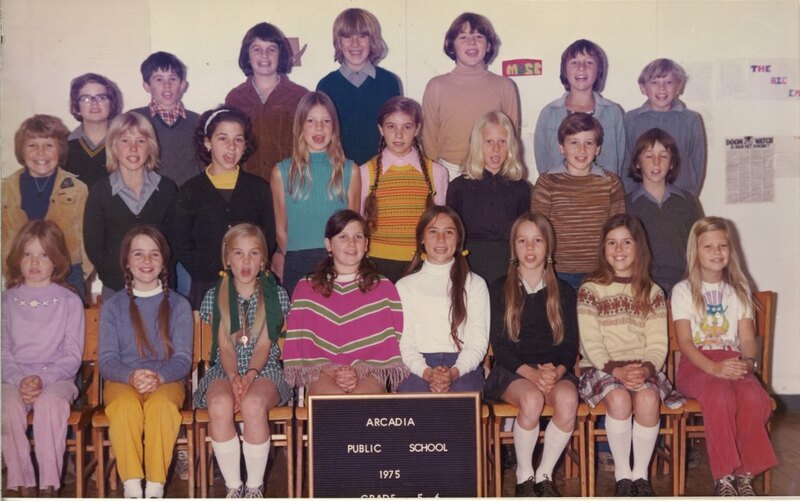 1974 – The Arcadia Post Office closed. 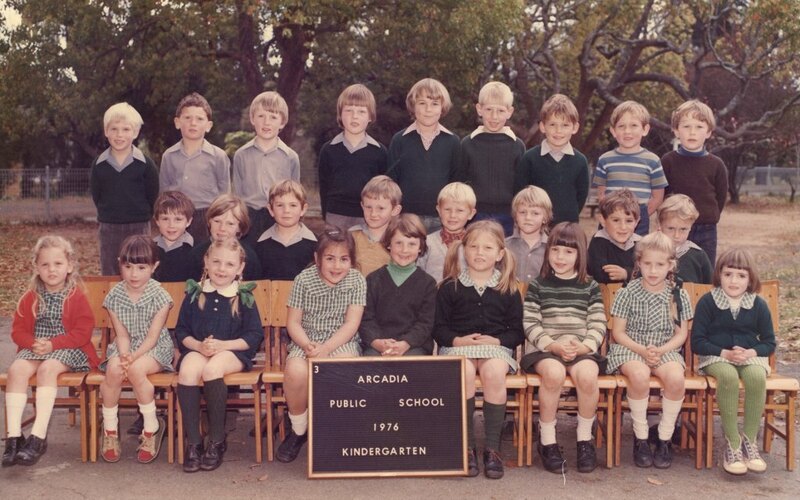 1974 – The first school sign was hand carved by Nicholas van den Dool. 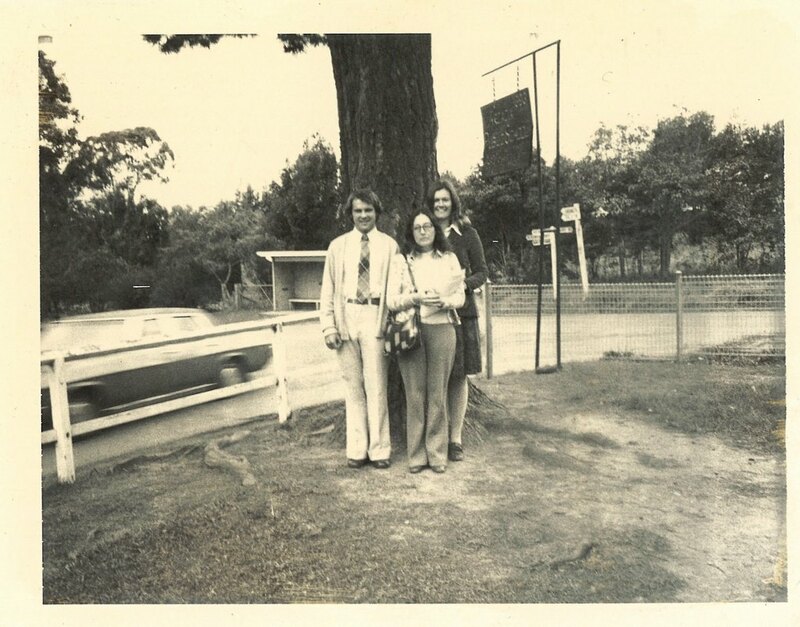 This was reconditioned in 2009 and stands at the corner of Arcadia and Blacks Rd. 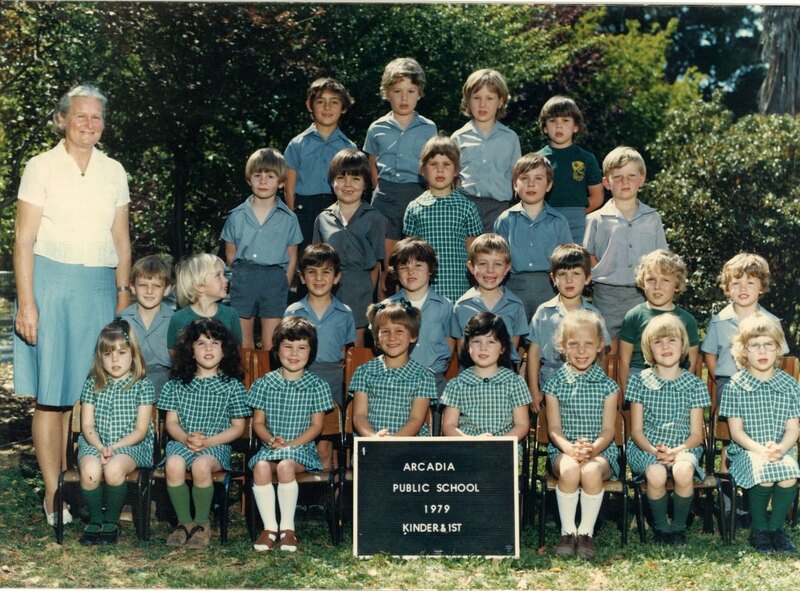 1974 – The school had its first telephone installed, paid by the P&C. 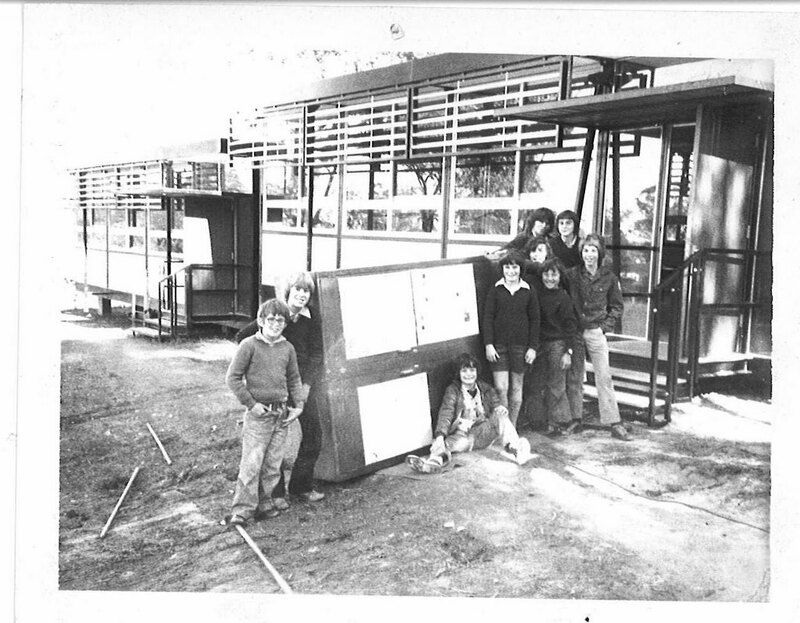 1974 – In May a new demountable classroom arrived for Mrs Heather’s year 3 class. A letter was also received confirming four new classrooms would be built plus catering facilities. Maps for this is in the archives but was never built. 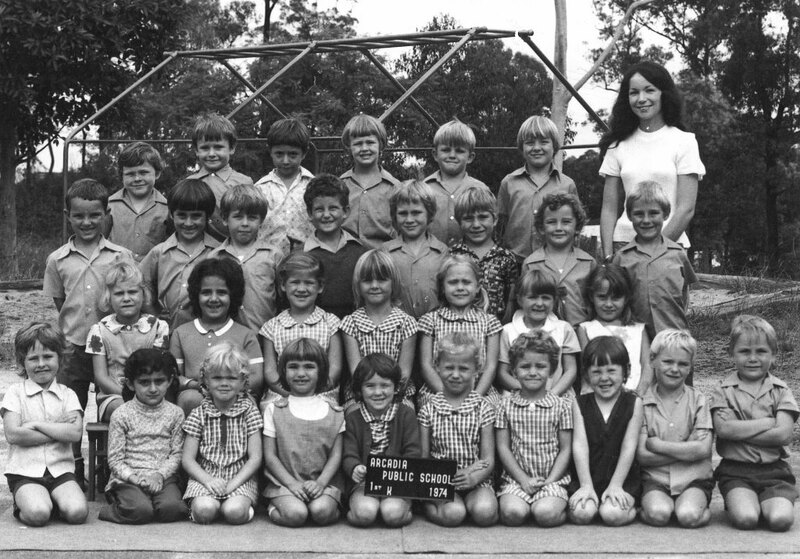 1974 – Mrs Phyllis Joss was appointed School Clerical Aide in March 1975. 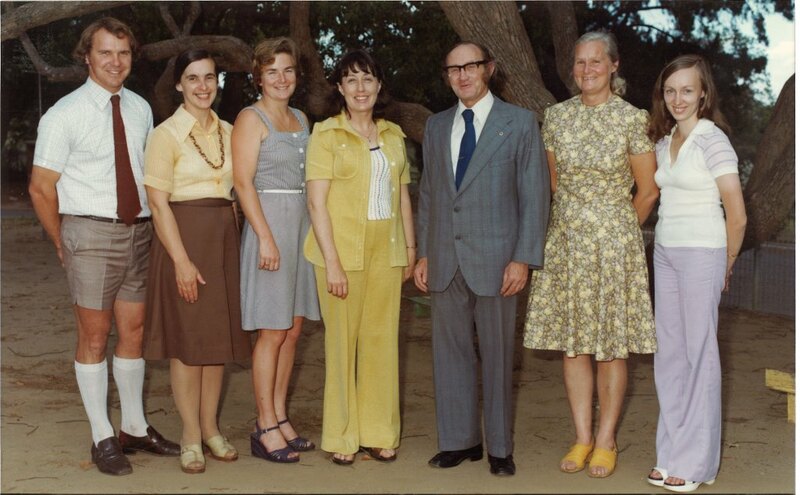 Prior to this Mr & Mrs Mobbs were the cleaners for a number of years. Mr & Mrs Mobbs were the cleaners for a number of years. 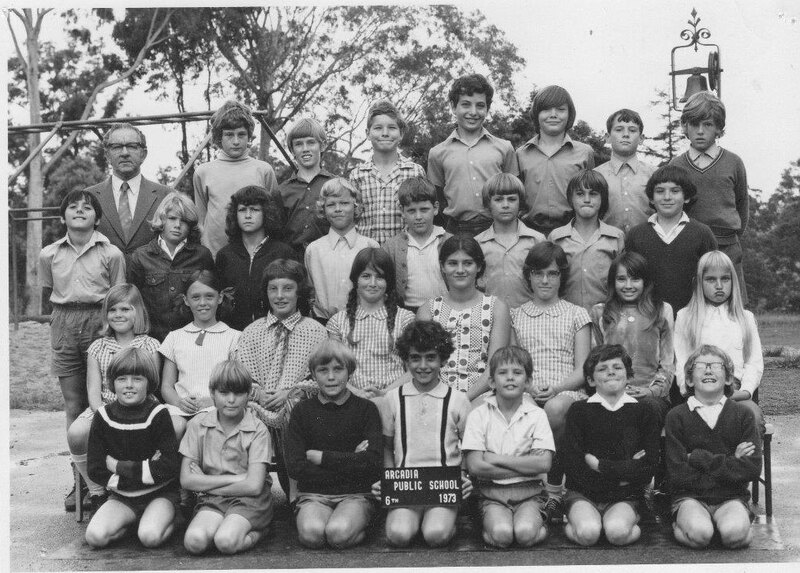 1975 – The original school sports houses were Baird and Rivett – named after the early headmasters. 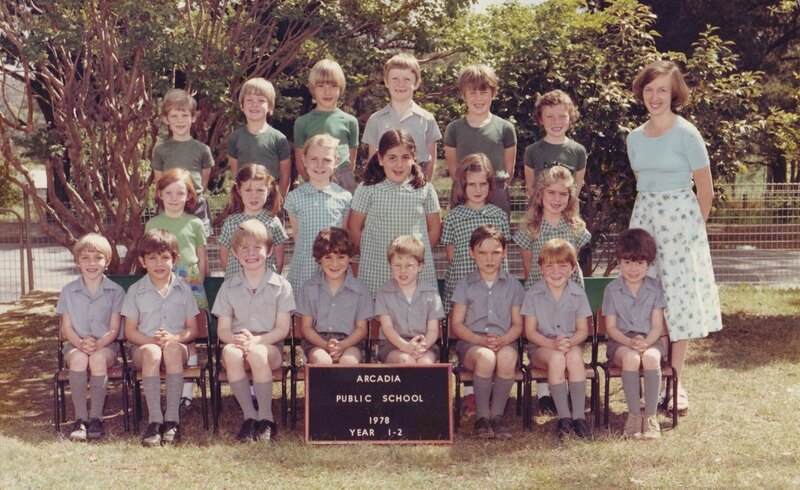 In 1975 the school was divided into four houses: Banksia (green), Boronia (purple), Bottlebrush (red) and Wattle (yellow). House banners showing the windflowers were made by Mrs Margaret Higson. 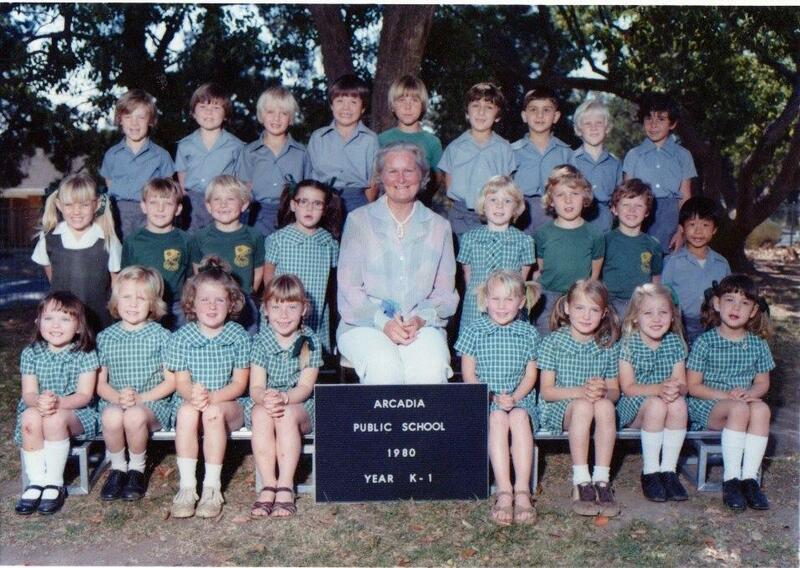 In 1991 new banners were made and embroidered by Mrs Jan Black. 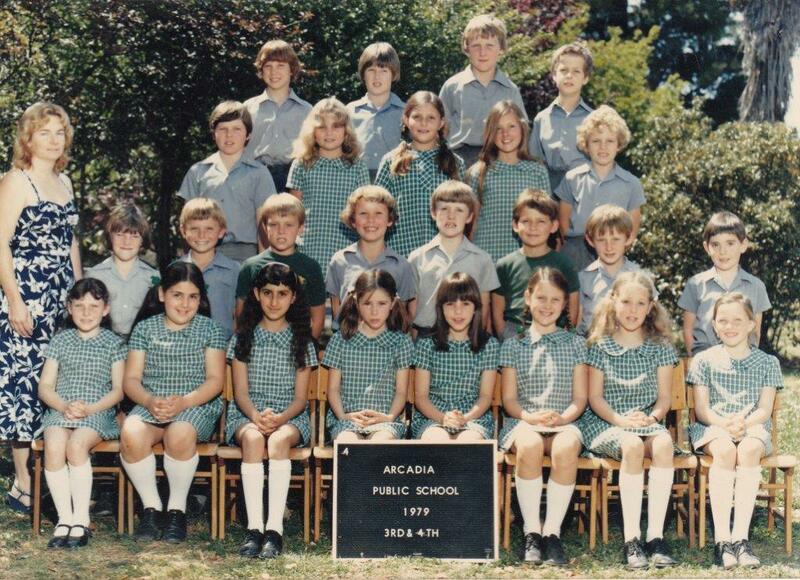 When Berrilee Public School would join Arcadia PS sports days, their house was called Berrilee. 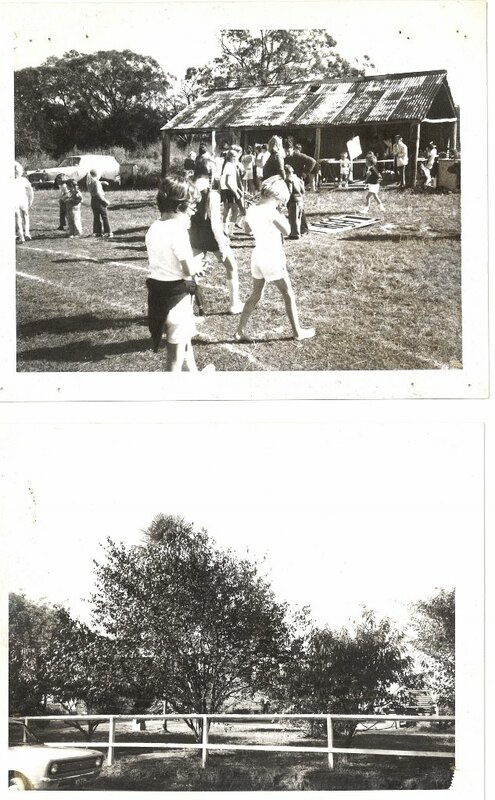 1972-1976 – the P&C was very active with fundraising activities including wine tasting, garden days; Paddy markets trips, fetes and fairs. 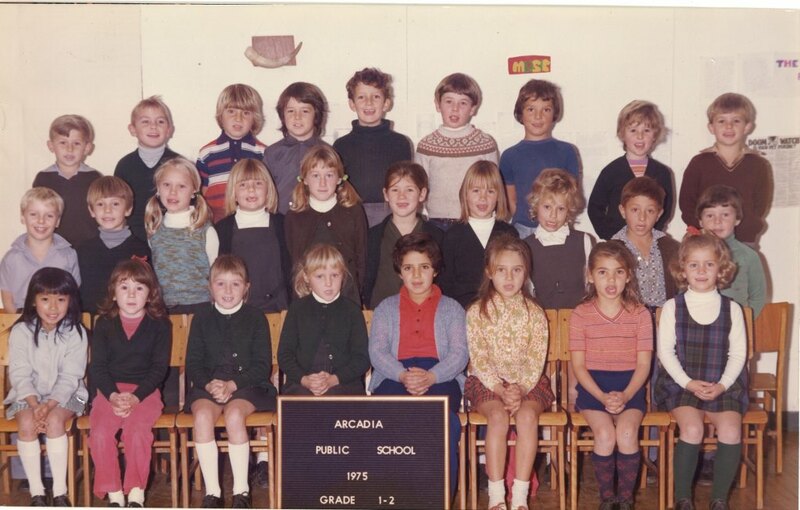 The money raised purchased educational materials, library books, art and craft material, typewriter, copier, tape recorders, sports equipment and playground seating. 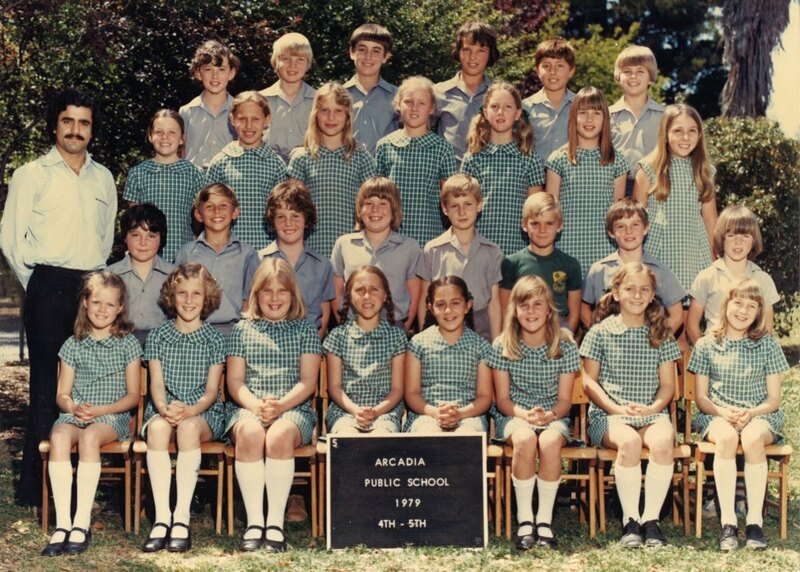 Parents were always available for various school activities including overnight excursions to Canberra. 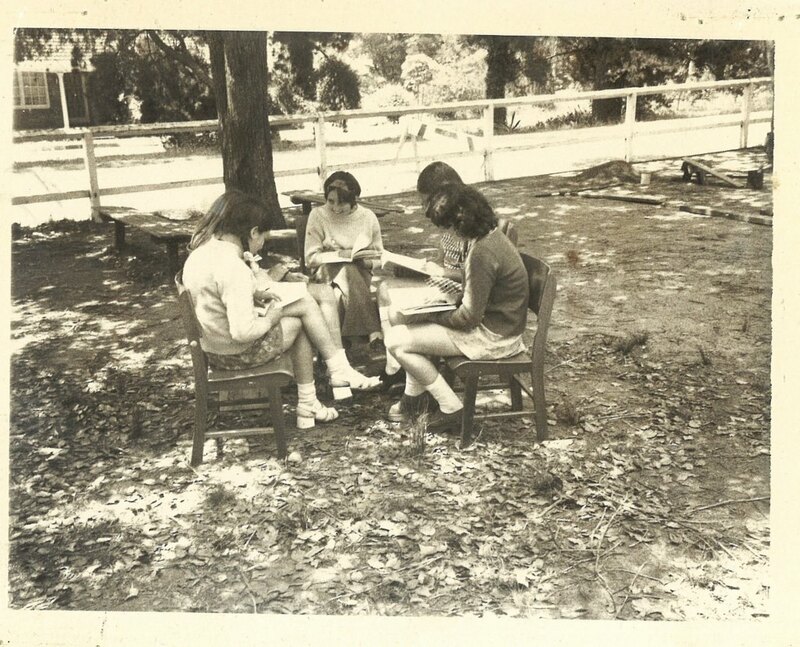 Vision Valley was used for end of year functions. 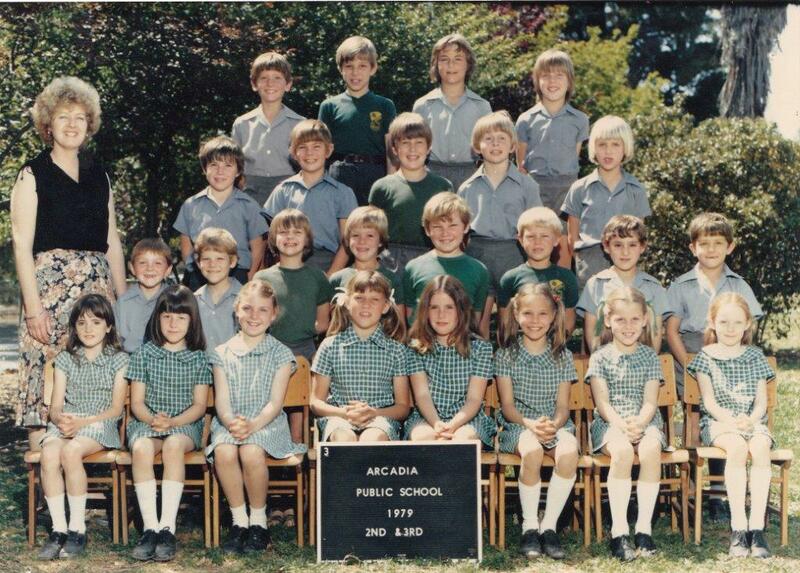 1976 – Mr Grunsell was Principal from August 1976 till December 1976, 154 pupils. 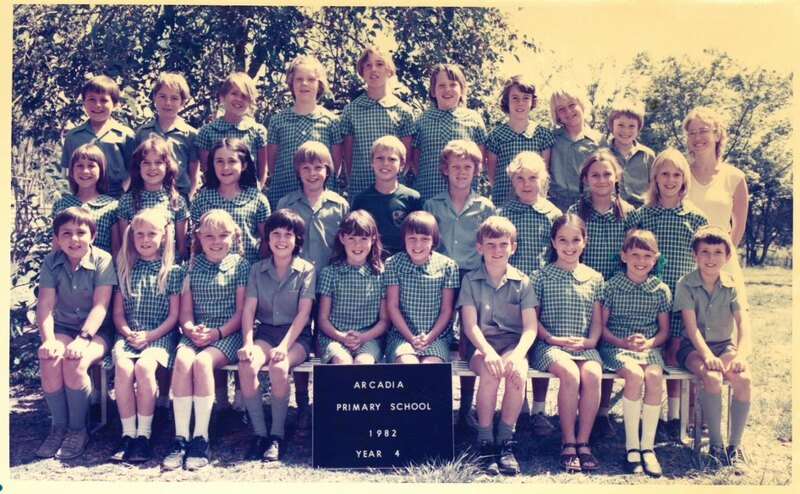 Mr Grunsell was appointed as a caretaker Principal and due to subdivision of local properties into five acre lots saw an increase of pupils coming into the school. 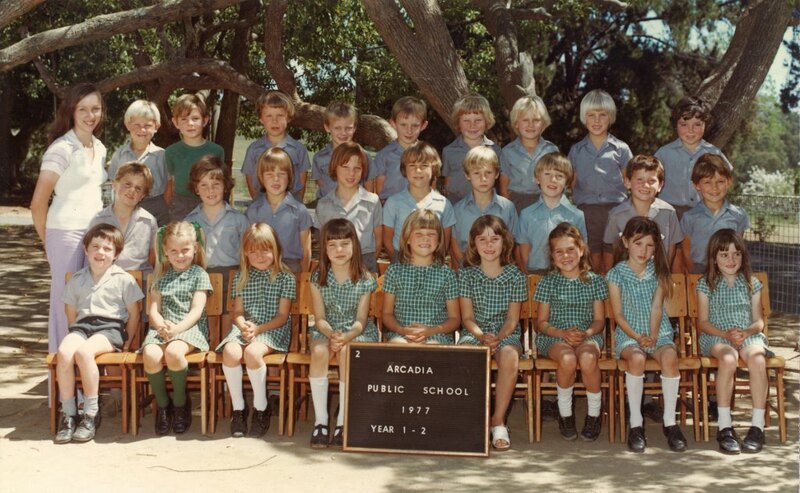 By December 1976 the pupils numbered 181 as a result. 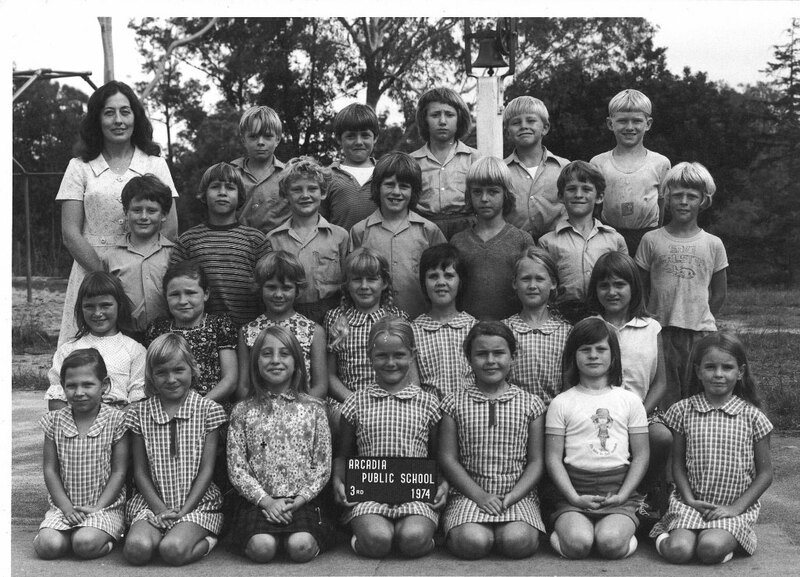 1976 – New playground equipment was erected by the P&C. 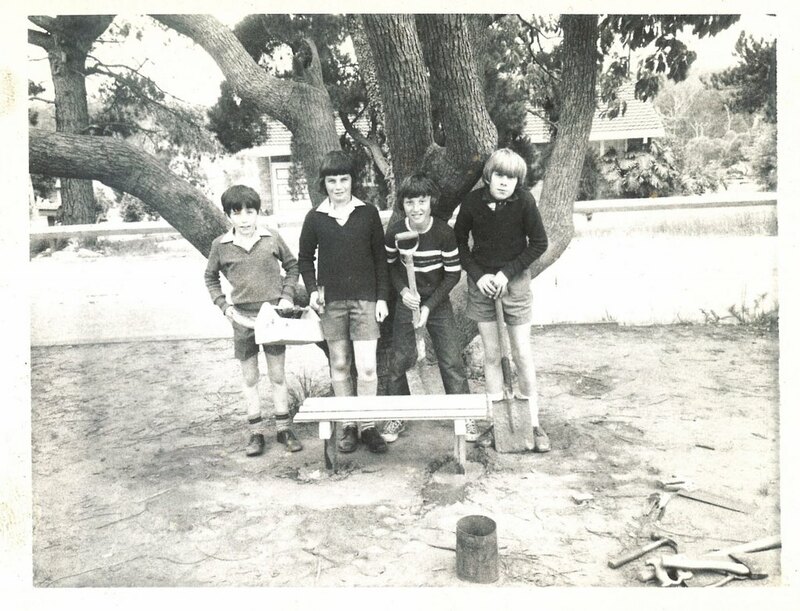 Including the timber ‘Pirate Bridge’, pipes and boat (Donated by the Johnson family) under the Camphor Laurel tree or Marble tree as they kids would call it. This would become the signature of the school in years to come becoming known as the school with the boat. 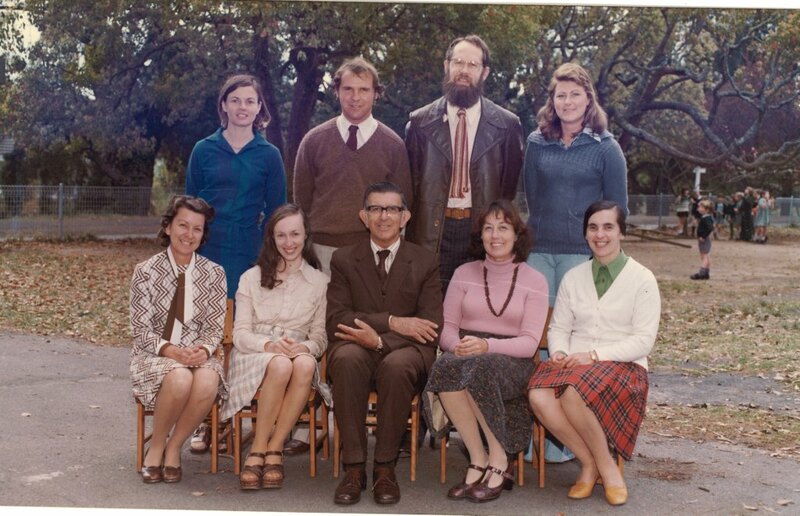 1977 – Mr Raymond Lloyd was Principal from February 1977 till September 1978, 158 pupils rising to 170. 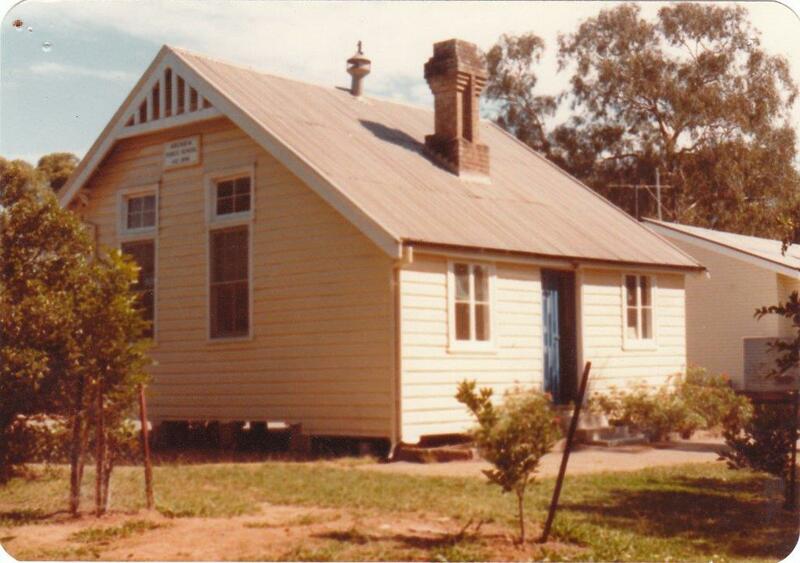 Both The Methodist and St Columbs Church halls were used for classrooms and the third demountable arrived. 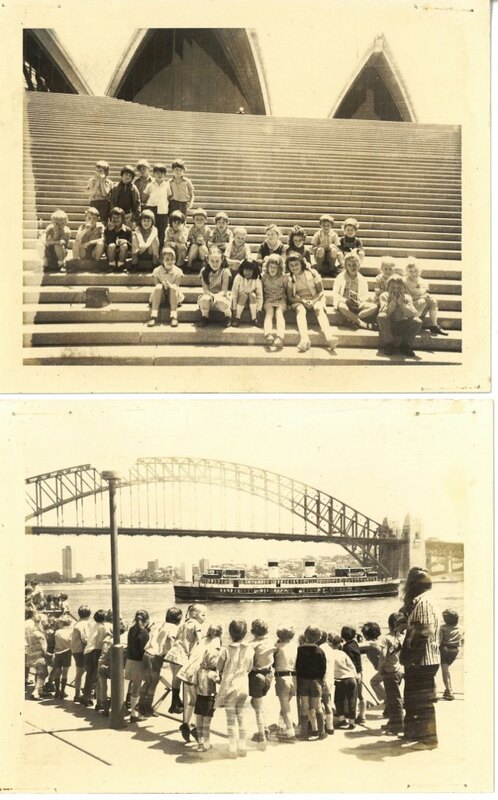 School excursions included camps to Katoomba, Featherdale Park, the whole school saw ‘Storm Boy’ at the Hornsby cinema and the Leyland Brothers visited the school talking about their travelling experience. 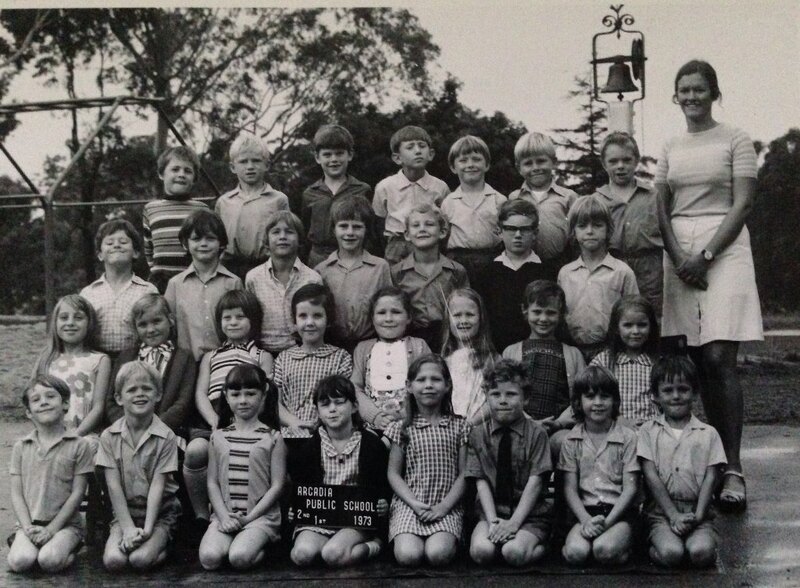 1977 – In November 1977 Mrs Judy Cadman designed the school badge. It is in the shape of a shield displaying the date 1894 and an orange tree to commemorate the main industry of the district when the school first opened. 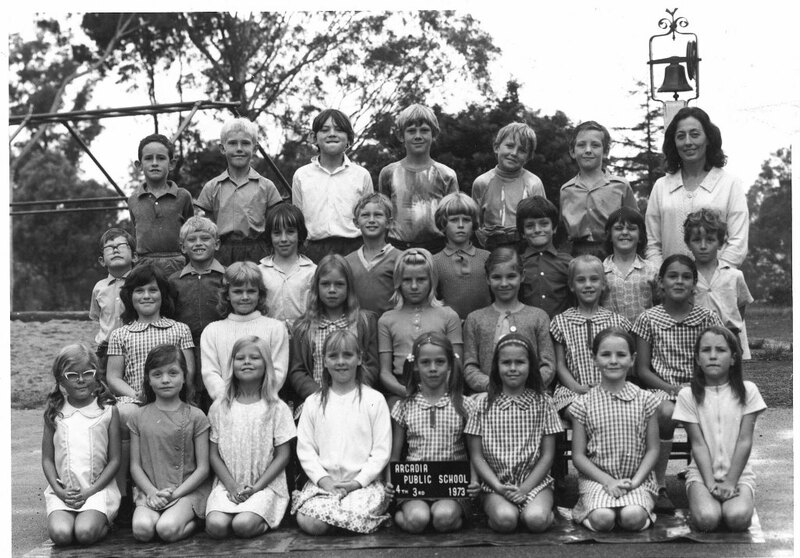 1977 – School Motto – Learn, Try, Enjoy was selected to commemorate the pioneers who established the early citrus growing industry. The initial badge was sold for $1 each. 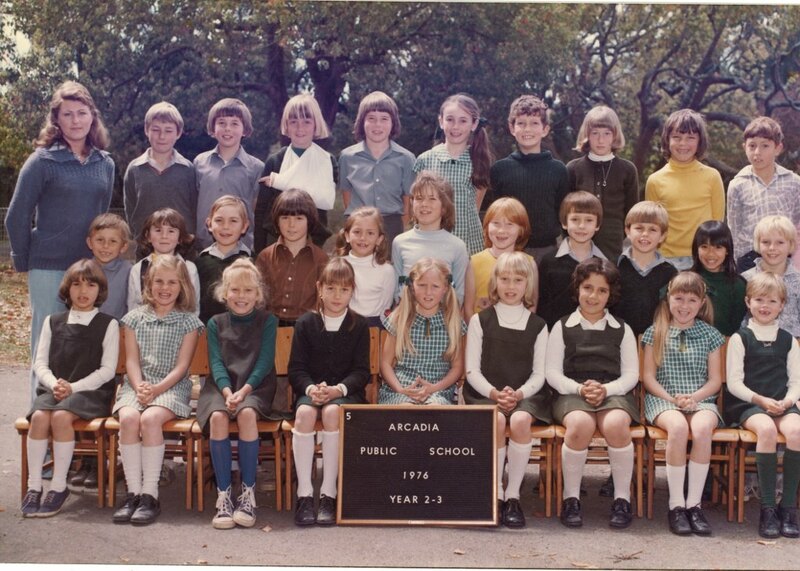 1978 – Mrs Diane Jamison joined the school as the new Cleaning staff. 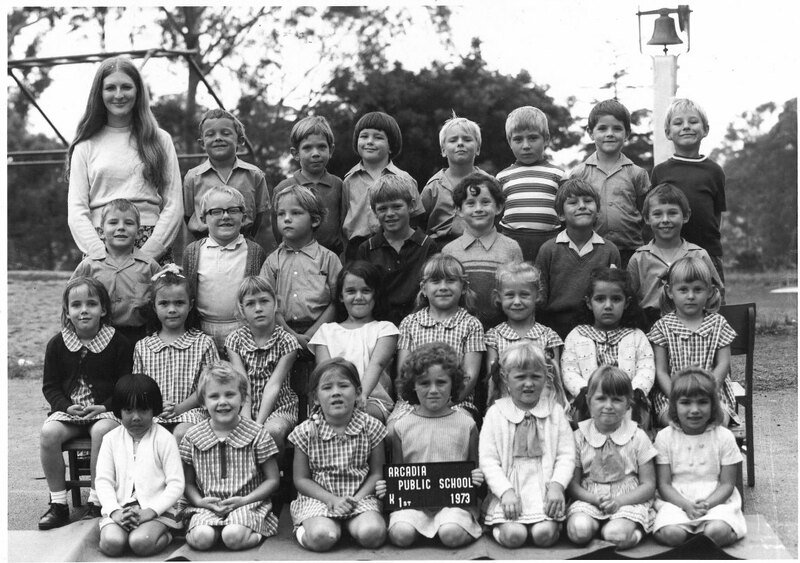 1978 – The introduction of the school bus service to Cobah and Peebles Rd. 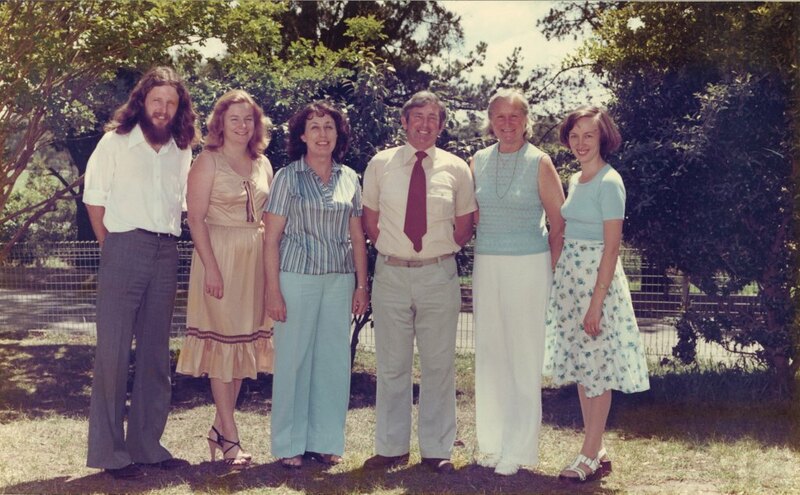 1978 – Mr Frank Childs was Principal from September 1978 till December 1989, 170 pupils spending 11 years at the school. 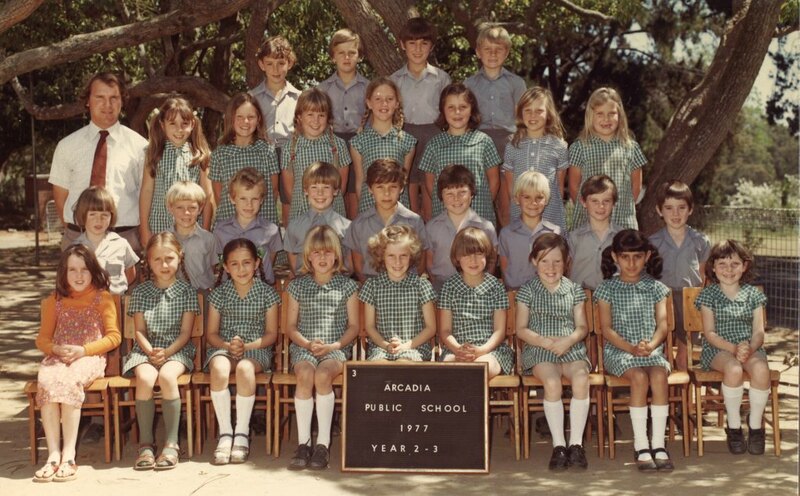 The school reached 181 enrolments in 1984. 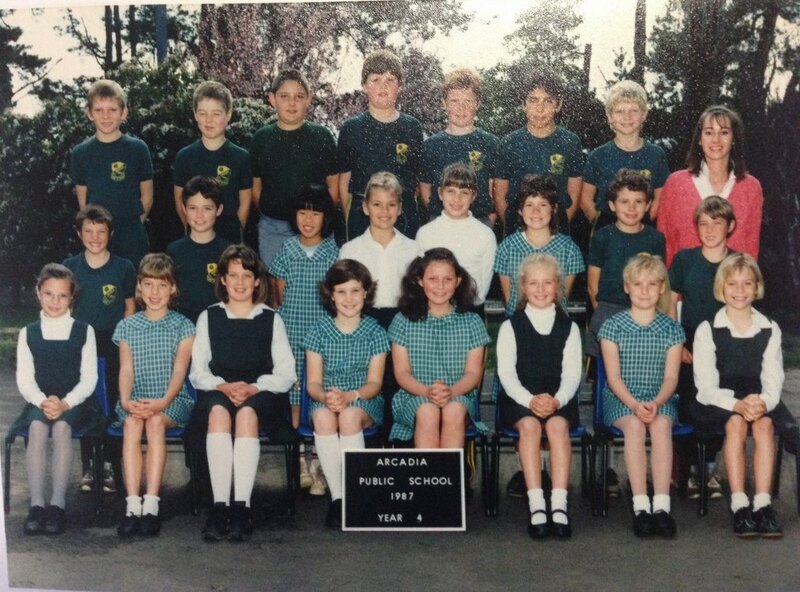 There were seven teachers and five demountable classrooms. 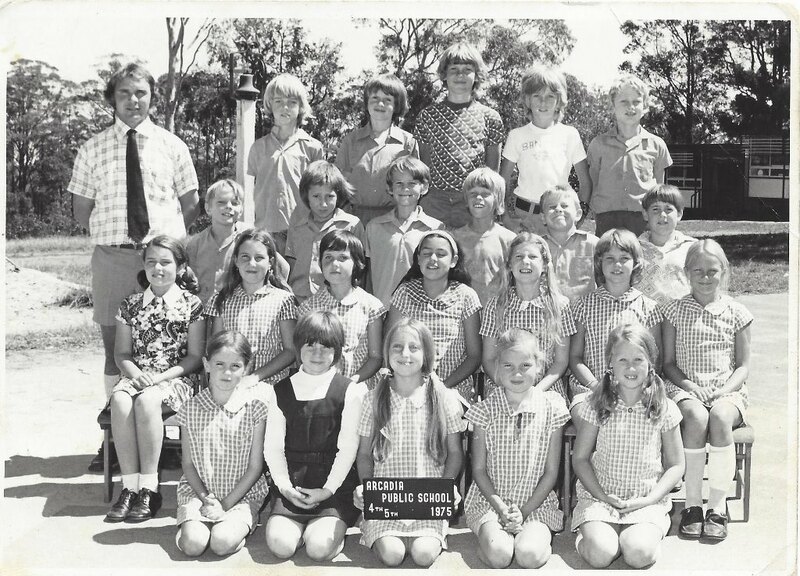 Exchange visits with Wakool School in the Riverina commenced in 1979 and continued for many years. 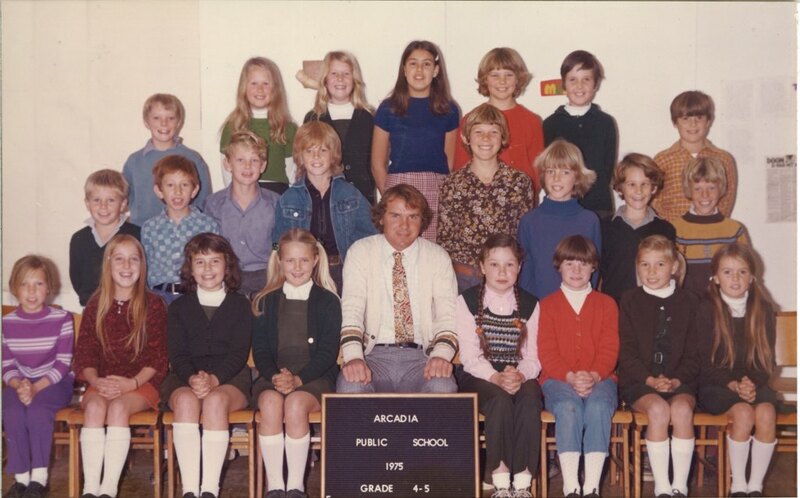 1978 – Noel Russell purchased the old juice factory site and started Arcadia Tyres in 1978. 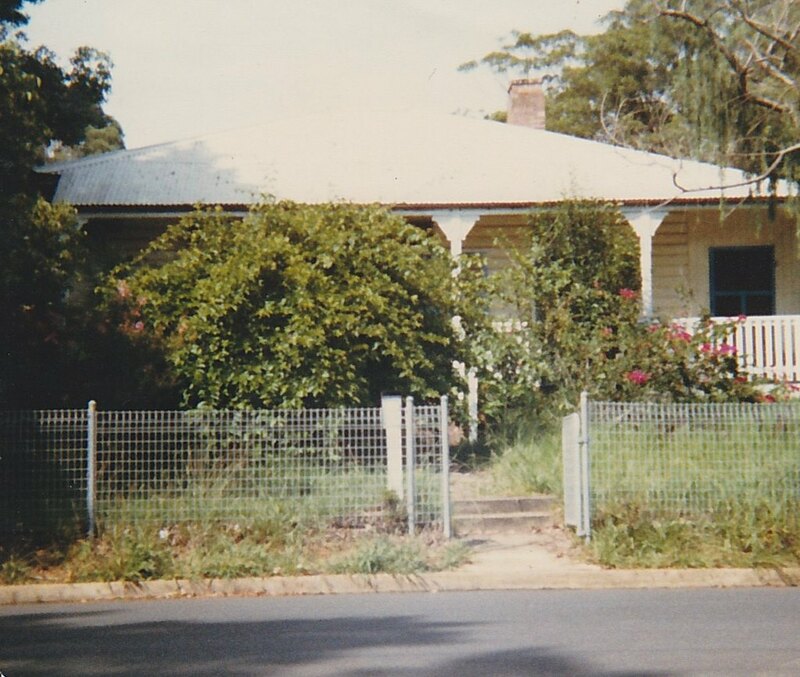 Noel passed away in 1982, leaving his wife Jan to operate the site. This site continues to be a hub of industrial activity with a smash repairs and mechanic operating from the buildings. 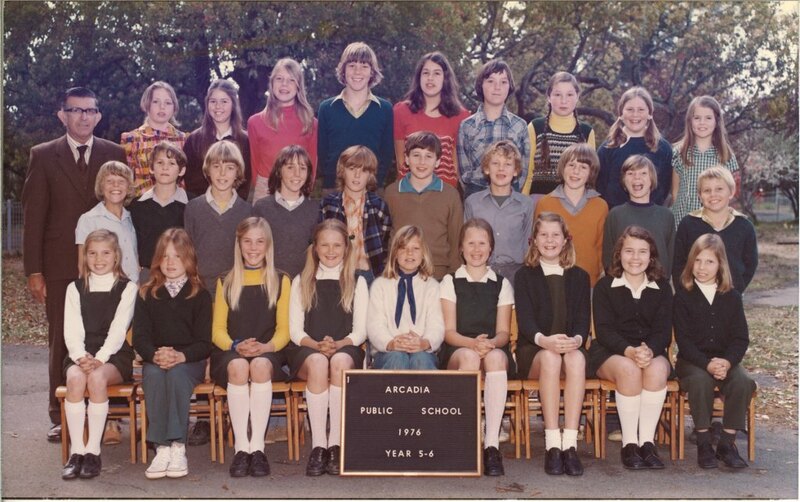 1979 – The school has its first photocopier installed paid by the P&C. 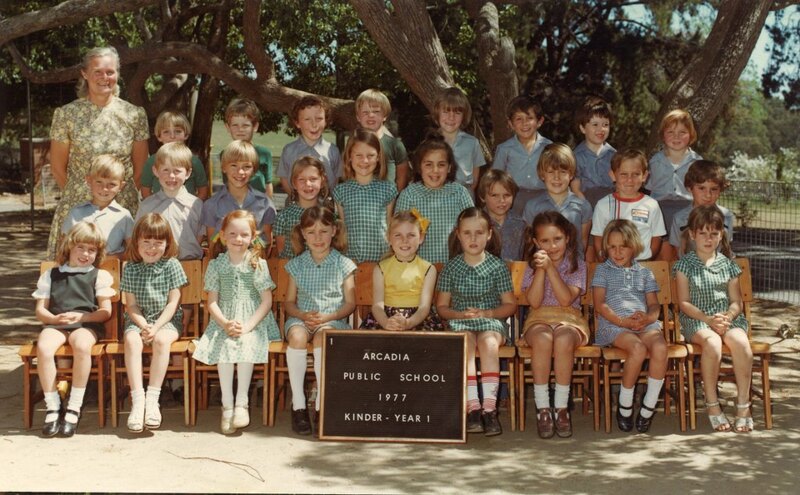 1979 – The first colour television was installed in the K/1 classroom. 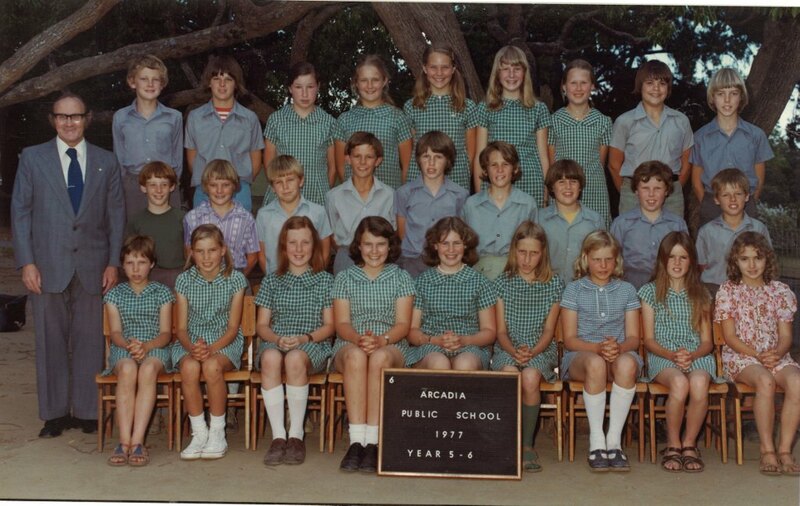 1979 – Year 6 started to use calculators. 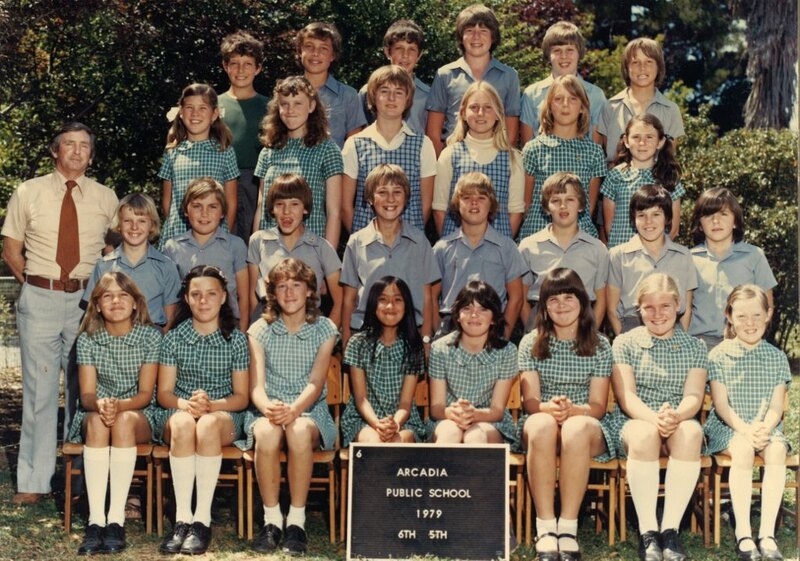 c1980 – the new class room included televisions, photocopiers, microbee computers, camera and other teaching aids. 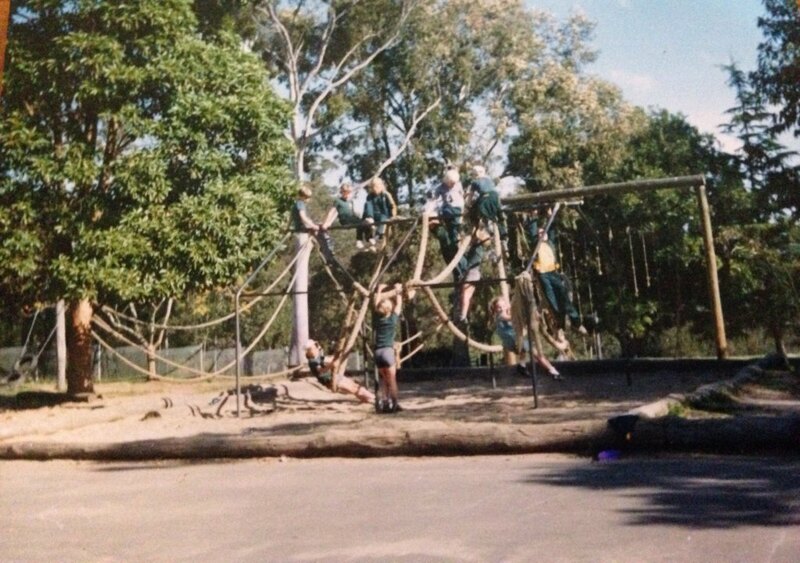 The P&C took on fundraising to pay for these additional items for the school. 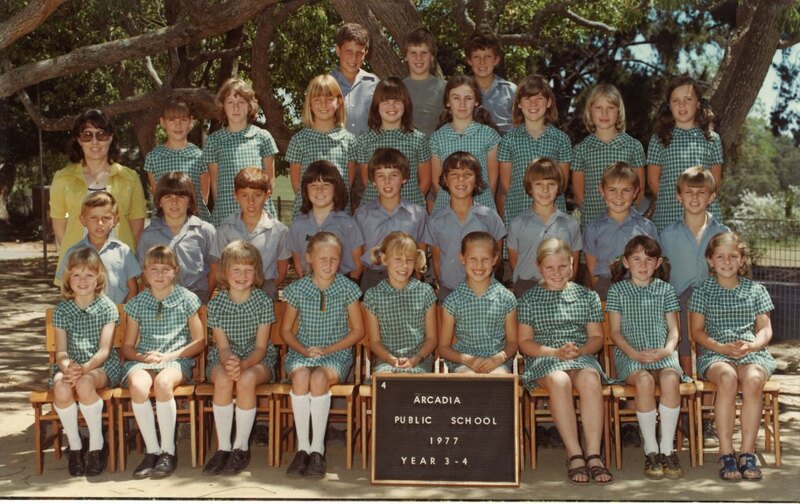 1980 – The first present from a year 6 class was 2 orange trees planted in front of the old building (the staffroom). 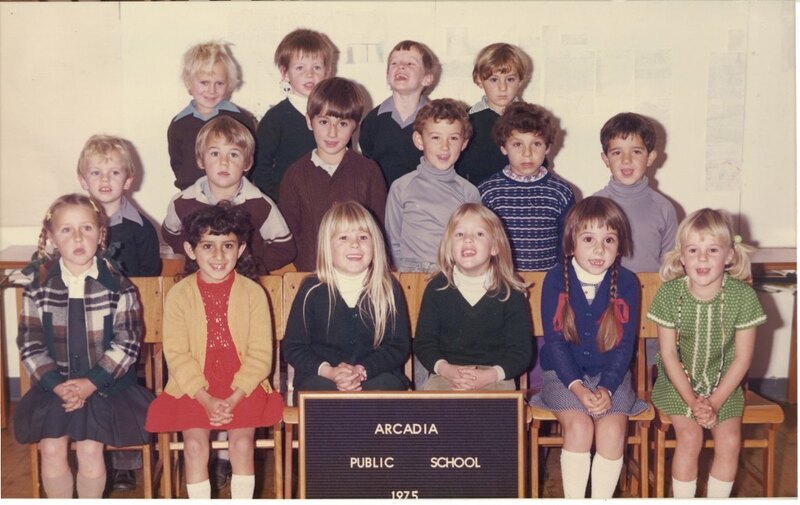 This was to become a tradition at the school each year. 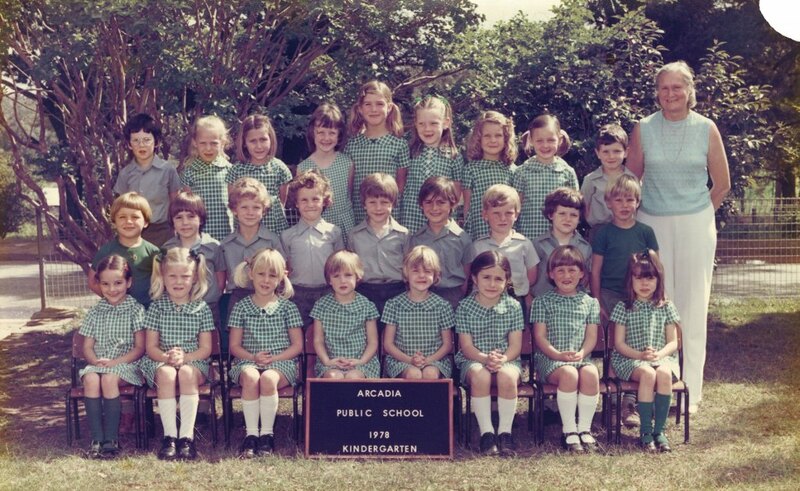 1972 – 1986 – In 1972 the P&C (Mother’s Auxiliary) put forward a proposal to purchase the land below the school. 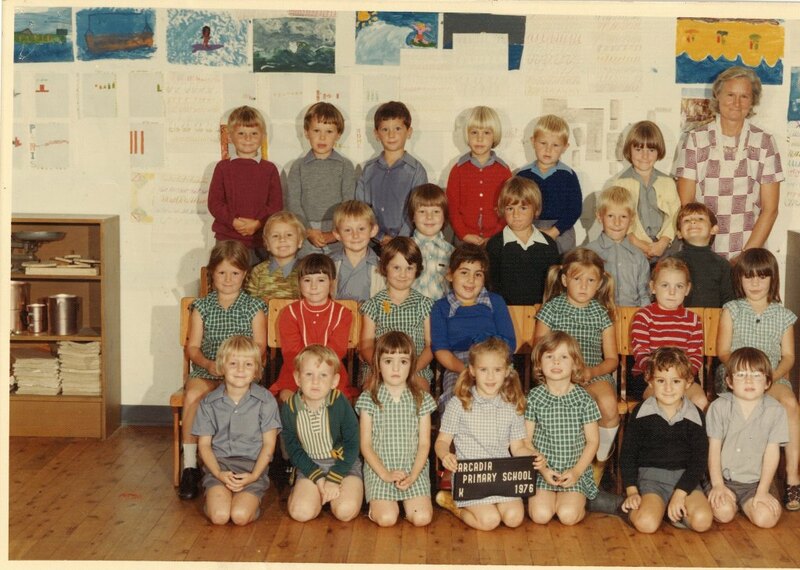 Mr Wangmann was in favour of selling part of his land to the Department of Education but this was put on hold despite the overcrowding as the school enrolments were at 133 pupils. 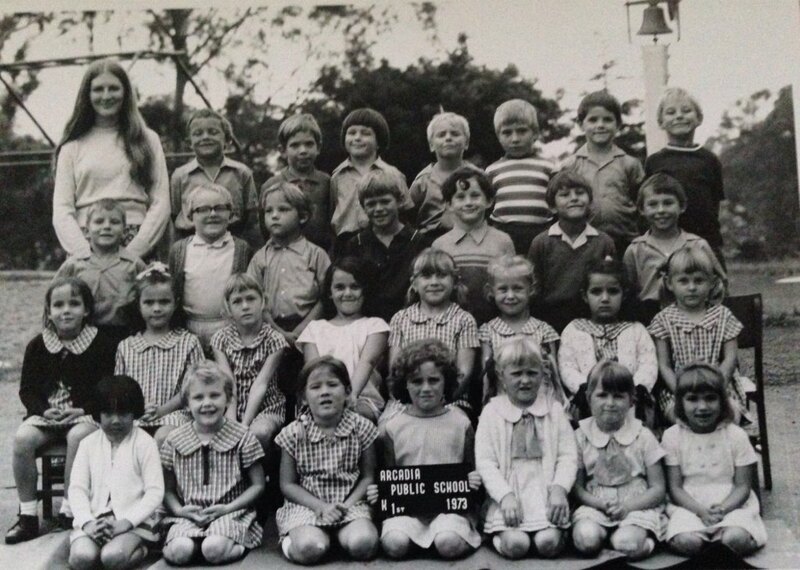 In 1981 the school reached 154 and the playground and accommodation for school buildings was at breaking point. 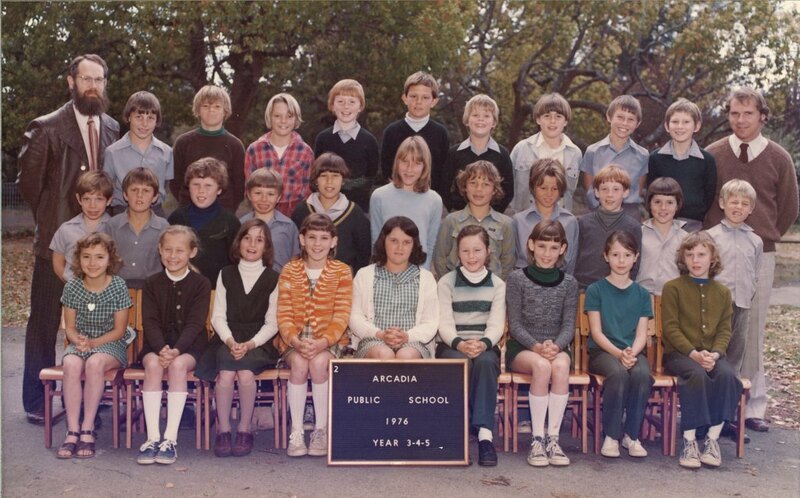 During the following years the other local buildings were used to house the classes including the local churches and three demountables along with the existing buildings. 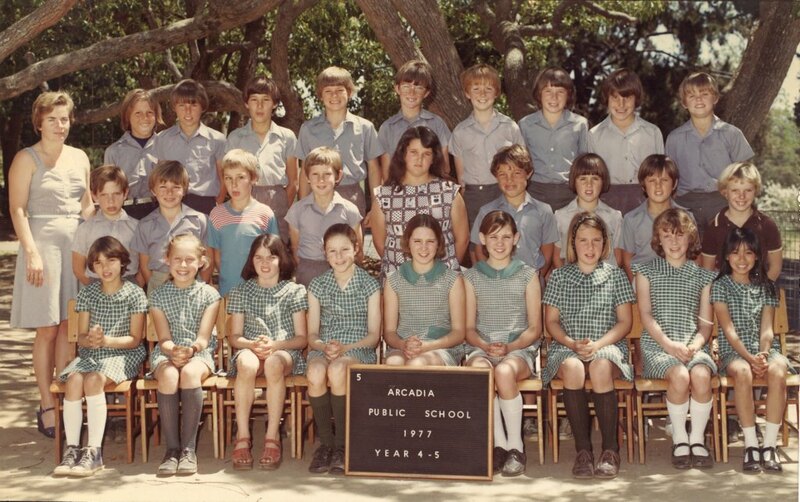 In 1984 the school enrolments grew again to 181 with seven teachers and five demountable buildings. 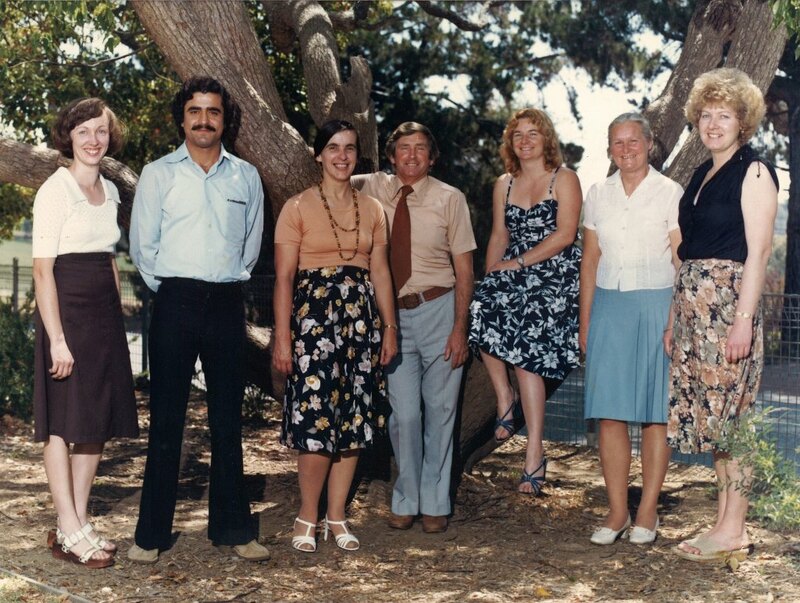 In 1979 the Department resumed the land at the rear of the school and Mr Bob Burgess was employed to remove the old orange orchard. 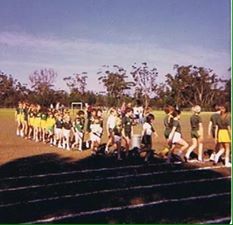 In 1986 a community effort saw the oval finally levelled and the oval completed.